This intriguing looking insect is an Oak Treehopper. They are common on oaks (quercus) and usually aren’t cause for concern. Often considered a pest, they typically only show minimal damage by minor stem scaring caused during oviposition. 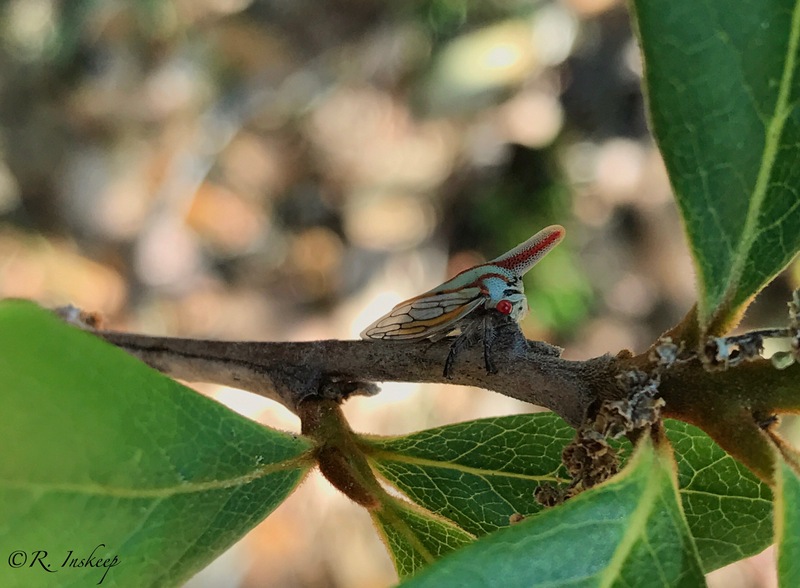 Oak Treehoppers mainly hatch in the spring and reach peak numbers by late March into May. There are a total of five nymphal instars and adults are sociable and often found in groups. Read more on the Oak Treehopper at BugGuide.net. Larval host for Great Southern White (Ascia monuste), Cabbage White (Pieris rapae) and Checkered White (Pontia protodice) butterflies. Read more on Virginia Pepperweed here. Virginia Pepperweed is edible. Larval host for Dainty Sulphur (Nathalis iole) butterflies. Read more about Bidens alba here. Bidens alba is edible. Larval host for Common Checkered Skipper (Pyrgus communis) and Tropical Checkered Skipper (Pyrgus oileus) butterflies. Read more about Sida ulmifolia here. See all Sida species in Florida here. Larval host for Red Admiral (Vanessa atalanta) butterflies. Read more about Florida Pellitory here. Florida Pellitory is edible. Larval host for American Lady (Vanessa virginiensis) butterflies. Some Gamochaeta species in Florida are not native and some are. The one in the image below is most likely non-native Gamochaeta pensylvanica. See all Gamochaeta species in Florida here. Is Your Landscape Beautiful Inside and Out? The spaceship has landed and is equipped with a portal. No wildlife here! Mr. Walter’s Viburnum never had a chance. will never flower for pollinating insects or support our feathered friends that would otherwise use his twiggy branches for landing. On the other hand, there are too many landscapes with only exotic plants. Imagine that you have a crush on someone you find very attractive, but after the first dinner date, you are put off by their dull personality. One might say that a lot of exotic plants are one-dimensional in the same way. They look good on the outside, but that’s it. Unfortunately, exotics are the scene in most Florida neighborhoods. Taking a walk through your urban hood might leave you feeling like you are in Africa or Asia without the cost of a plane ticket. Of course, not all non-native exotic plants should get an immediate sandle-kick back to their homeland. Some of them have a place in our gardens, such as homegrown fruits and veggies, herbs or a select few “Florida friendly” plants like those Old Fashioned Pentas. A real Florida landscape of Slashpine. c trees from China. No, you came to see Blue Spruce and Quaking Aspen trees that are representative of that part of the region and the wildlife that uses them. oods and to find a Florida native plants nursery in your area, visit Florida Association of Native Nurseries HERE. Also, visit Florida Native Plant Society for a list of natives for your area and so much more HERE. Turkey Tangle Frogfruit (Phyla nodiflora) is a wonderful grass alternative and attracts pollinators like this Gray Hairstreak butterfly. The Fiery Skipper is in the family Hesperiidae and the subfamily Hesperiinae (Grass Skippers). Fiery Skippers have short antennae. Males have a wide black stigma, a patch of modified scales on the wings that release pheromones during courtship with females. The underside of the hindwing is typically scattered with little black spots. On females, the upperside is dark brown with an irregular orange band. The underside of the hindwing on females is typically pale brown with paler checks. Fiery Skippers are very small in size and measure around 1 1/4 to 1 1/2 inches, or 3.2 to 3.8 cm. Male Fiery Skippers will perch in grassy areas such as lawns and wait to mate with a female. Larval host plants include Florida native St. Augustine (Stenotaphrum secundatum) grass and non-native grasses such as Bermuda Grass (Cynodon dactylon) and Crabgrass (Digitaria spp.). Females lay eggs singly on the underside of their host plant leaves or on other nearby plants or objects. Adult Fiery Skippers nectar from a variety of different native flowering plants including Bidens alba (Beggarticks), Blue Mistflower (Conoclinium coelestinum), Ironweed (Vernonia spp. ), Milkweed (Asclepias spp.) and Dune Sunflower (Helianthus debilis). Look for these common, fast moving skippers in sunny, weedy fields, residential lawns, gardens and roadsides where they fly all year round here in Florida. A male Fiery Skipper perching on non-native category 1 invasive Torpedo Grass – Panicum repens. Likely waiting for a receptive female to mate. An excellent shrub for residential landscapes, Sophora tomentosa var. truncata (Yellow Necklacepod) provides food and cover for wildlife. The flowers are enjoyed by bees, butterflies and hummingbirds. Yellow Necklacepod is very easy to grow and tolerates poor soils and drought. Looking at the showy seedpods that drip from this shrub you can see where its common name comes from. The yellow flowers are very showy and bloom practically all year long on terminal spikes. Sophora tomentosa var. truncata is a large to medium shrub that typically reaches 8-10 feet. The leaves are a shiny green and slightly hairy when young and become glabrous (smooth) as they mature. Yellow Necklacepod works well as a specimen or accent shrub inland or coastal areas where it tolerates a moderate amount of salt wind without damage. Yellow Necklacepod will grow on the west coast from Levy County south to the Monroe Keys and on the east coast from Brevard County south. In the wild, you can find Yellow Necklacepod growing in shell mounds, maritime hammocks, edges of coastal forests and thickets, beach dunes, coastal strands, inland borders of marine tidal swamp and marine tidal marsh. *note that there is a non-native species Sophora tomentosa var. occidentalis commonly sold. A way to tell the difference is S. occidentalis has fuzzy leaves giving it a more silvery appearance. This one should be avoided as evidence tells us that it can cross pollinate and hybridize with our native species. Our native S. truncata has shiny, glabrous (smooth) leaves after they mature. Purchase yours from a reputable Florida native plants nursery to avoid the issue. Visit Florida Association of Native Nurseries to find a retail Florida native plants nursery in your area. Free Plants? Sign Me up! Many native wildflowers, vines and shrubs reseed and give you more bang for your dollar. Not only are native plants aesthetically pleasing and provide for wildlife that has depended on them for eons, a lot of them come with the additional perk of multiplying and showing up year after year. Late winter going into spring, I curiously diddle-daddle around the garden surveying for emerging new life. As I anticipate warmer weather when the garden is lush and teeming with a riotous display of insects, I thank the clouds above that I am not pulling those bothersome weeds that are synonymous with hot and rainy summer days. Instead, I enthusiastically dig and pot up some of the seedlings that the wildflowers and other native plants have so graciously gifted. Some of them are happily given away to friends and some are moved to a more desirable area of the garden. Here is just a sample of the “free” native plants that faithfully reseed in my landscape. Bagworms are the architects of the moth world, surrounding their larval bodies with sticks, leaves and debris. They drag around their home made of natural materials as they feed on over 50 different families of trees, shrubs and herbaceous plants. Several different species of Bagworms can be found in Florida, but according to University of Florida Entomology and Nematology, T. ephemeraeformis is not widely distributed. They are more frequently found north in peninsular Florida or above zone 8a. Common hosts include evergreens such as Red Cedar (Juniperus virginiana), Live Oak (Quercus virginiana), Elm (Ulmus spp. ), Viburnum (Viburnum spp. ), Maple (Acer spp.) and Pine (Pinus spp.). Thyridopteryx ephemeraeformis is considered a virginiana) in particular and can cause significant damage. This is especially true with evergreens as they do not regenerate new leaf growth as readily as deciduous trees. When the larvae are ready to pupate, they will attach their cases (bags) with silk, typically to a branch where they will be well disguised and blend in well with their surroundings. When the adult male ecloses he will force himself out of his case, losing many of his wing scales. The male will then seek out adult females that are legless and wingless. Females do not leave their cases (bags) and the male will have to insert his abdomen into her home. Soon after mating, the female will lay her eggs right inside her own case. After the eggs overwinter, they will hatch and disperse, constructing bags of their own. If you want to see more pollinators than you can wrap your head around, then Florida native Bidens alba (Beggarticks) is just the ticket. I’ve always let Bidens alba grow in patches here and there in our landscape. Before I really knew the benefits that Bidens alba provides for wildlife, I appreciated the aesthetic beauty of their small aster blooms. They remind me of those flowers I might have picked when I was a child and conjure up a carefree, easy breezy feeling of nostalgia. For a wildlife gardener, Bidens alba really has it all. This wildflower grows without care and sometimes more than we’d like. Most regard Bidens alba as an aggressive weed and rightfully so. Managing this wildflower in our landscape has proved to be a labor of love. Our garden is anything but tidy and I don’t mind pulling up the seedlings where I don’t want them. Picking the clingy seeds off of my shoes and shorts is all part of deal, requiring a little patience. I see it as more time spent in the garden and a necessary commitment to the critters that depend on this plant. Birds will use the seeds for food, a huge variety of pollinators visit the flowers and it’s the larval host for the Dainty Sulphur (Nathalis iole) butterfly. Earlier this year was the first time I saw the Dainty Sulphur butterfly visit our Bidens alba. Once I recognized the butterfly, I began to see more of them as they flitted about from leaf to leaf to lay eggs. I had to wonder if they’d been here all along and I just didn’t notice them. It is also quite possible that I am the only one in the neighborhood that lets Bidens alba grow and it took them awhile to find it. Dainty Sulphur butterflies are very small with a wingspan of an inch or even less. They stay very close to the ground and are commonly found in open, dry disturbed sites where their larval host grows, such as roadsides, meadows, fields, or a weedy garden such as mine. Catching a glimpse of their dorsal wings can be difficult as they flutter very fast. I find them easiest to photograph when they are resting horizontally towards the sun’s rays to warm themselves up. When they are perching, they rarely open their wings and usually keep them closed, revealing their elongated forewing with black spots and a yellow-orange strip along the edge of their wing. Male and female Dainty Sulphur butterflies are very similar in appearance and I have never tried to differentiate them while out in the garden or in the field. According to Florida Museum of Natural History University of Florida, the female has more of an orange flush and more extensive black markings than males. I will have to look for this the next time I am out observing them. Dainty Sulphurs can look different depending on the time of year. In the dry season of fall and winter, you will find that they have a darker, more olive-colored ventral hindwing. In the wet season of summer, they will appear more yellow. There is also a white form Dainty Sulphur, but this is rare and I have yet to see one or meet anyone who has. Females will lay one single egg on a tender young Bidens alba leaf, especially young seedlings. Late instar caterpillars are green with a slim purplish dorsal stripe. The pupa, or chrysalis, is green. These butterflies will also use Florida native Helenium pinnatifidum (Southeastern Sneezeweed) and other Helenium (Sneezeweed) species as their larval host. They have also been shown to use non-native Thymophylla tenuiloba (Bristleleaf Pricklyleaf) and non-native cultivated Marigold. If you love butterflies such as the Dainty Sulphur and attracting wildlife to your landscape, Bidens alba is more than worth considering. I have found that the benefits of growing this wildflower far outweigh my efforts to keep it managed in our landscape. Florida native Solidago sempervirens (Seaside Goldenrod) invites this awesome pollinator to our garden. Blue-winged Wasp adults use nectar for food, but they might also feed on the juices from beetles. Mmmmm, tasty! The larvae are parasites of scarab beetles, mostly the June Beetle and the introduced Japanese Beetle. In nature, you are most likely to find this wasp in fields, wildlife gardens and meadows where their larval hosts are present in large numbers. We see plenty of June Beetles in our native wildlife garden, where they seemingly fly without a pilot’s license and clumsily run into the walls of the house or get caught in someone’s hair. When it’s time for mating, male and female Blue-winged Wasps do a rather fanciful courtship dance, flying close to the ground in an “S” or figure 8 pattern. After the deed is done and a female is fertilized, the male says “sayonara” and will have nothing else to do with her, including parental care later on. Another common name for this pollinator is the Digger Wasp. This is a fitting name as the female will dig down into the ground with her mandible and spiky legs in search of beetle grubs. What happens next is straight out of a science fiction film. When she finds a grub, she stings it to paralyze it. She will sometimes burrow further down, dragging her latest victim with her to construct a cell to make room for her young to grow. She will then lay an egg on her new larval host. The Blue-winged Wasp larvae will feed on the grubs inessential organs first. This keeps the parasitized grub alive for a week or so before the grub spins its cocoon. The adult wasp will emerge from this cocoon in roughly three weeks unless they over-winter, in which case they will emerge once the temperature warms in the spring. Males and females look quite similar in appearance, but males have longer antennae and a three-pronged pseudo-stinger that is used in copulation. Agapostemon splendens, or Sweat Bee; Halictid Bee, is a member of the Halictidae bee family, one of the six families in the order Hymenoptera. Halictidae is a remarkably diverse group and they are highly variable in appearance. The most recognizable are the green metallic Sweat Bees, Augochloropsis, Augochlorella, Agapostemon and Augochlora species. The sun illuminates their unmistakable shimmering color as they land on flowers to collect pollen. They seem to prefer flowers in the Asteraceae (composite) family. In Central Florida, I usually see them in the warmer months of March through November gathering pollen from Gaillardia pulchella (Blanketflower), Bidens alba (Beggarticks) and Helianthus debilis (Dune Sunflower). Agapostemon splendens are ground nesting bees. Although they are considered solitary nesters, it is not unusual for females to share and allow other females to enter the nest. Male and female A. splendens are easy to tell apart. The male is more slender than females with a black and yellow striped abdomen. The female is plumper with an all green body. The female typically has darker wings while males are usually clearer. 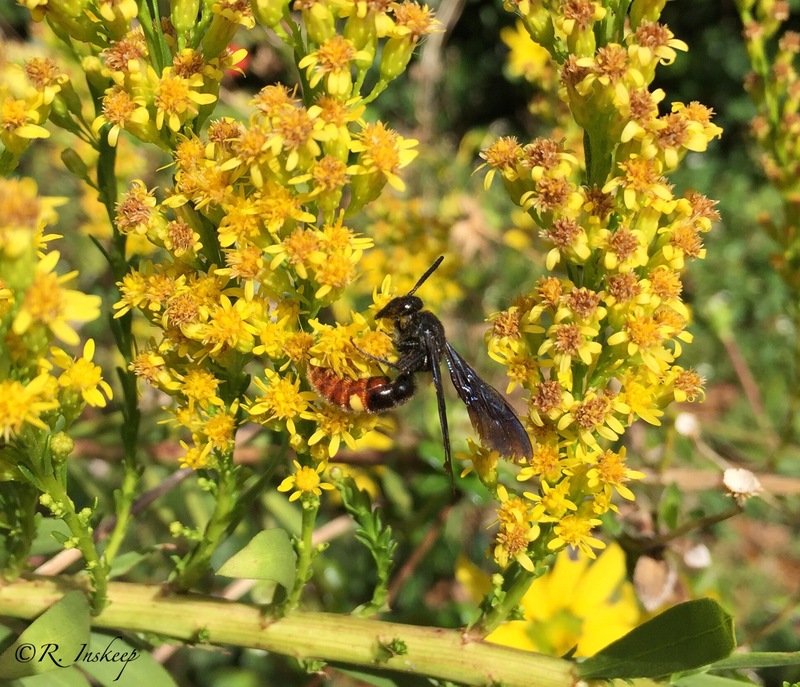 You can attract Sweat Bees and other native ground nesting bees to your landscape by planting Florida native wildflowers, especially those in the Asteraceae (Composite) family and by retaining areas of bare soil for nesting.